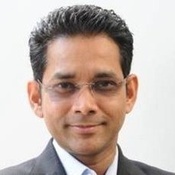 Ravi Kiran is deeply engaged with the start-up ecosystem in India, as an angel investor, mentor, advocate and critic. He has made angel investments in and is involved with over forty start-ups. He is a professional business builder, a growth adviser, management speaker, blogger, a thought leader in the area of Innovation and Agility and a technology entrepreneur. He co-founded VentureNursery, India’s first angel-backed start-up accelerator, in 2012. VentureNursery accelerated 21 start-ups, including budget hotel chain OYO Rooms, talent engagement platform Talview and artificial intelligence company arya.ai. He is also the co-founder of Innovation and Agility consulting company Friends of Ambition and a Director on the board of Center for Innovation, VNIT Nagpur’s technology incubator and mentor with several organizations. He is frequently invited as a keynote speaker on Business Growth, Leadership and Culture, Innovation and Agility. He is part of a small group of global contributors in Wharton Future of Advertising Program. He is building his own Marketing and Sales tech startup focused on making growth-minded B2B companies better at winning customers and helping Marketing and Sales people become more effective. He is also researching for his book on evolving nature of entrepreneurship in a hyper-noise era. Earlier in his corporate avatar, he led the South East Asia operations of Publicis Groupe owned Starcom MediaVest Group [SMG], the World’s largest media network, as Region CEO. He was one of its youngest regional leaders and created many new lines of business for the Company. He also served on the Company’s Global Management Group and Global Product Committee. Ravi Kiran is a Mechanical Engineering graduate from NIT Srinagar, University of Kashmir and MBA from Faculty of Management Studies, University of Delhi. He lives in Mumbai with wife Shalini Rawla [Founder and CEO of renowned Consumer Diagnostics company – The Key] and dog Kian.